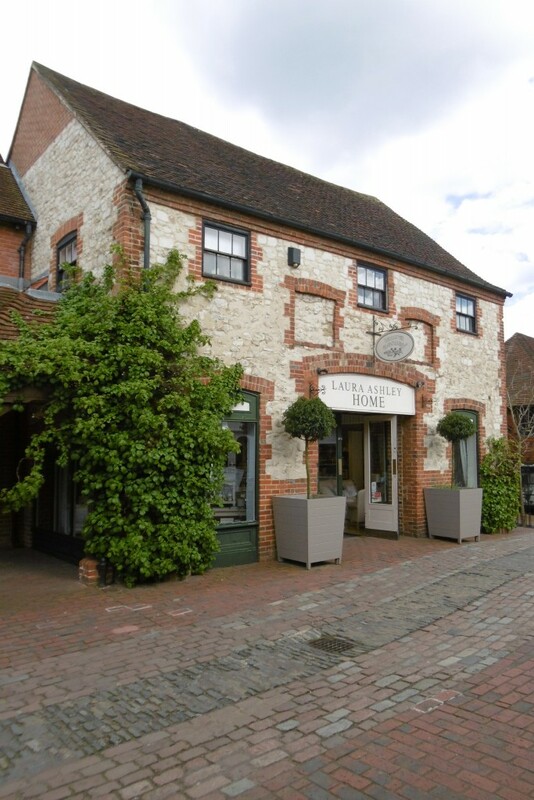 If the diarist and antiquarian John Aubrey (author of Brief Lives) is to be believed hop growing and drying arrived in Farnham, Surrey by the end of the 16th Century. He wrote Perambulations of Surrey in 1673 and recorded that at Farnham there are hops in as great plenty as in any part of England. Old Mr Bigmnall’s father was the first that planted hops here, which husbandry he bought from Sussex76 years ago and since they have planted ever larger quantities so that now about this town are no less than 300 acres of hop yard. The slopes of the hills on either side of the valley of the River Wye to the west of Farnham towards Alton were well suited to hop growing. The hop business appears to have remained modest in the 17thC, but took off in the 18th C. A local writer William Gilpin recorded in 1775 From the terrace of the castle we overlooked what may properly be called the Vale of Hops for we saw nothing but ranges of that plant… The value of the hops spread under our eyes was supposed to be at least £10,000. (over £1m in today’s money.). In 1800 there were more than 1000 acres of hop garden in and around the town. There was strong local pride and writers regularly asserted that the best dried hops came from the area. Indeed Farnham hops sold at £9-11 a 240 lb bag compared to £7-9 for hops from Kent and Sussex. While Farnham was the commercial centre of hop growing and drying in this part of England the Hampshire/Surrey domain was extensive. The map shows only the central area aroudn the River Wey. Surviving hop kilns attest to hop territory extending further west to Odiham and Alton and south to Selbourne and Petersfield. The centre of gravity is very much in Hampshire, even though Farnham is just in Surrey. In the later 18thC hops and hop kilns dominated Farnham to an extant not matched anywhere in Kent, for example Maidstone or Canterbury. 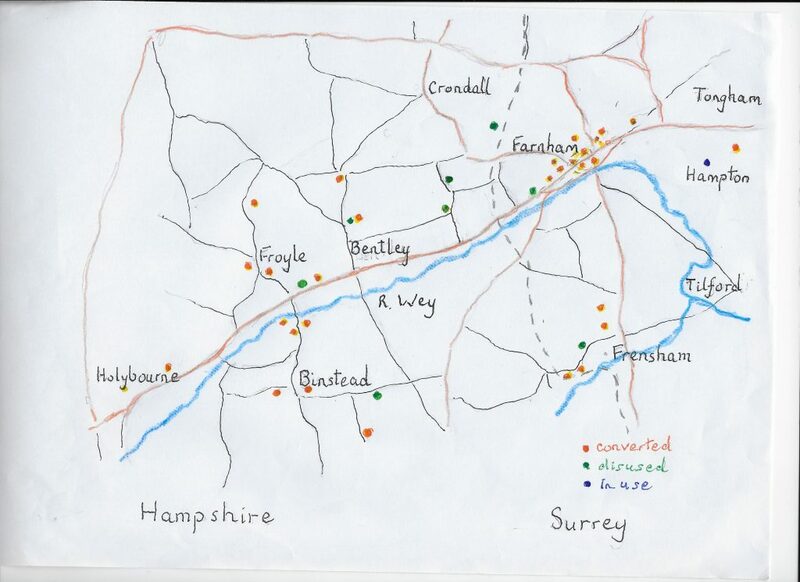 The cartographer John Roqcuer made a map of Surrey in 1768 and this shows the town surrounded by hop grounds. There were kilns and maltings all over the small town which was a well known staging post for travellers. The plan shows their location and, where available, the date of the documentary evidence of their existence. Those marked in red are the ones which still exist, now converted into offices, shops or dwellings. 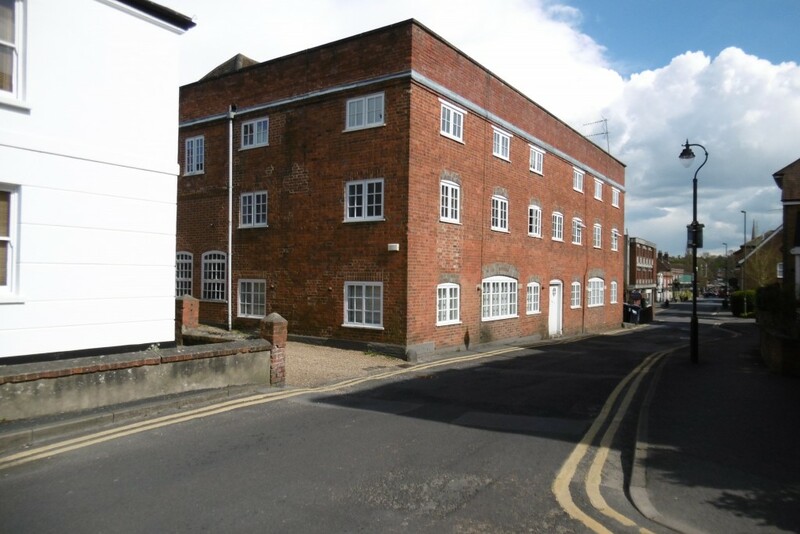 The main testimony to the profitable hop (and corn) trade is the lines of handsome 18th C town houses in Farnham. In the mid 19th C Farnham had a population of 5800, 6 breweries and 70 hop planters and dryers. For the modern visitor it is hard to imagine the scene 200 or more years ago. 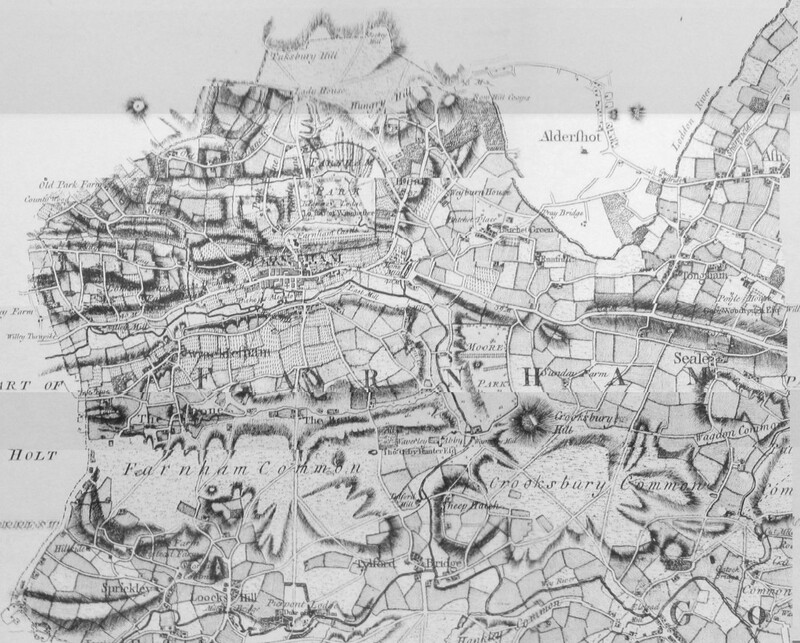 Part of John Rocquer’s map of Surrey , 1768. The fields all around Farnham etched with vertical lines signifying poles are hop grounds. The Hog’s Back is on the right. 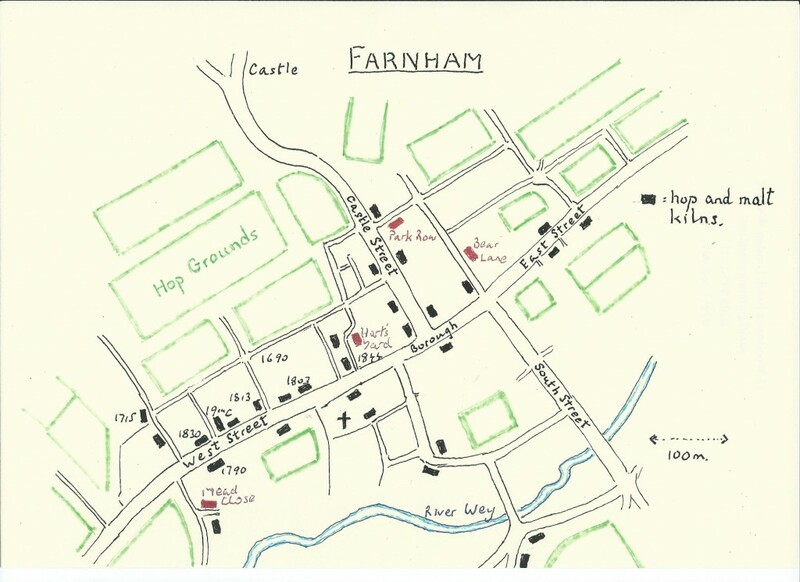 Plan of 18th C Farnham showing the dominance of hop yards and kilns in and around the town. 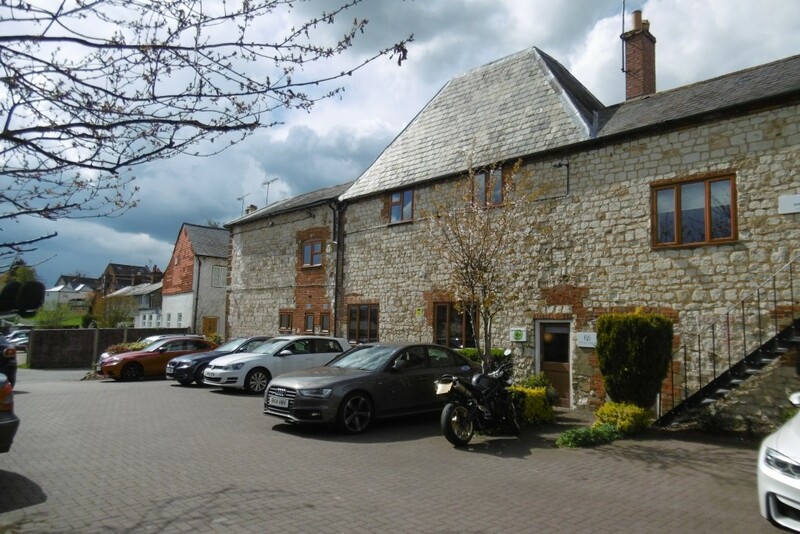 There is little surviving evidence of hop kilns of the 17th and 18th Centuries with one notable exception: Coxbridge Farm on the western approaches to th town, near the A31. This brick and timber building developed in phases over more the two centuries. 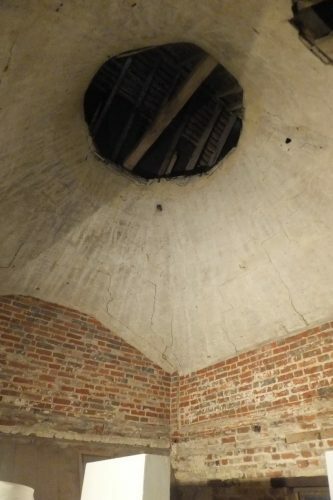 Looking up the kiln on teh NE corner built entirely within the ridge roof of a stotrage barn, square below, round above. The height of the drying floor can be seen on the brick walls, not more than 5 eet above the furnace. 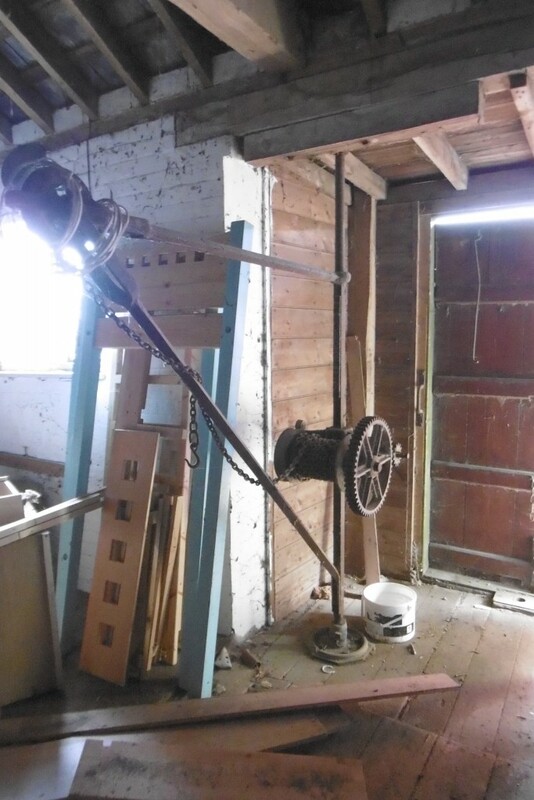 The well preserved hop press at Coxbridge Farm is from an early generation of mid 19thC cast iron presses, less bulky than the later motorised models. 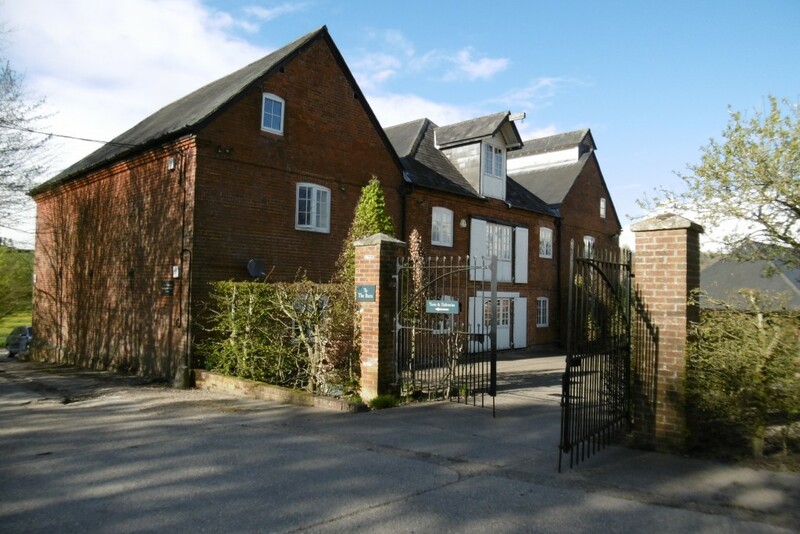 Unlike Kent and Sussex, Surrey and Hampshire were brewing counties and 18thC Farnham had malthouses which would also have been used for drying hops. Writers at the time noted all sorts of little ways in which the growing and picking practices in Farnham differed from Kent. 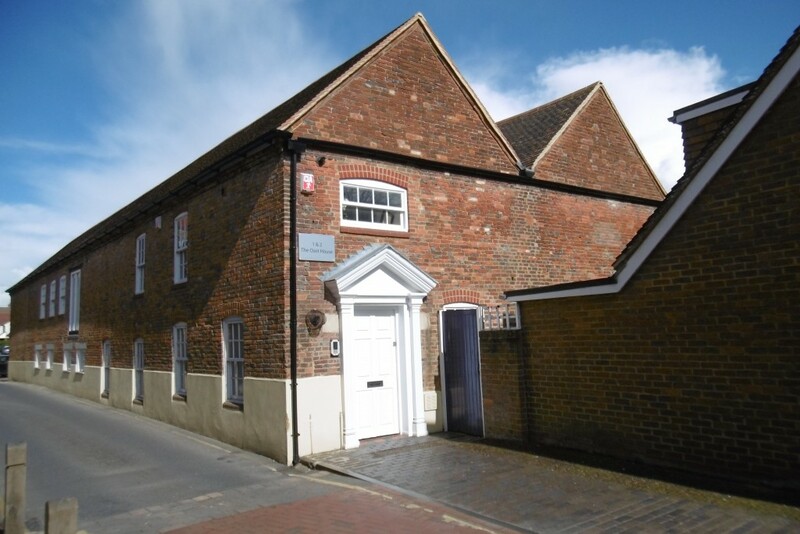 But we do not know whether there were early archtitectural features which distinquished the local hop dryinig buildings from oasts of Kent and Sussex. The density of hop gardens around the town would have meant that the drying season in September dominated the community. Marshall, 1798, say that the “finishing frolicks” were better than Kent. Pickers dressed up and paraded through the streets with a fiddler at their head “singing and shouting in tunes of true licentiousness”. 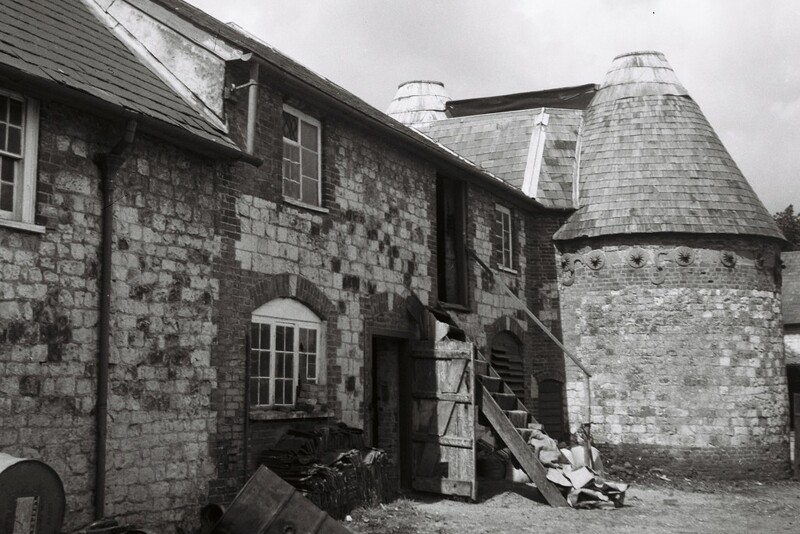 Slate rooves, rectangular kilns with long louvered vents rather than cowls and the use of dressed chalk blocks in construction are distinctive features of the hop kilns of the Farnham area. Near Farnham was a band of hard chalk , much less friable than most chalk, robust enough to make a good building material. 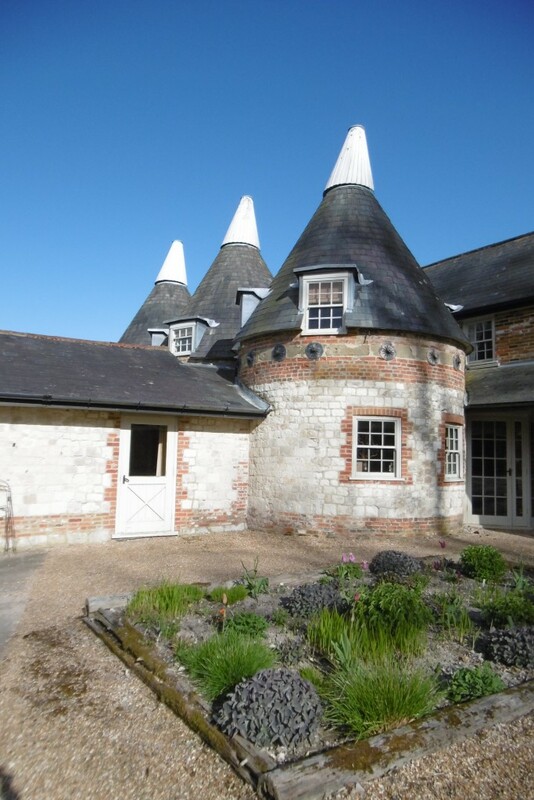 The first set of round kilns built at Bury Court, Bentley and Mead Close in Farnham are excellent examples. Square kilns predominate in the area but there are fine examples of round kilns as well. Bury Court Farm, near Bentley. 1960 Photo. 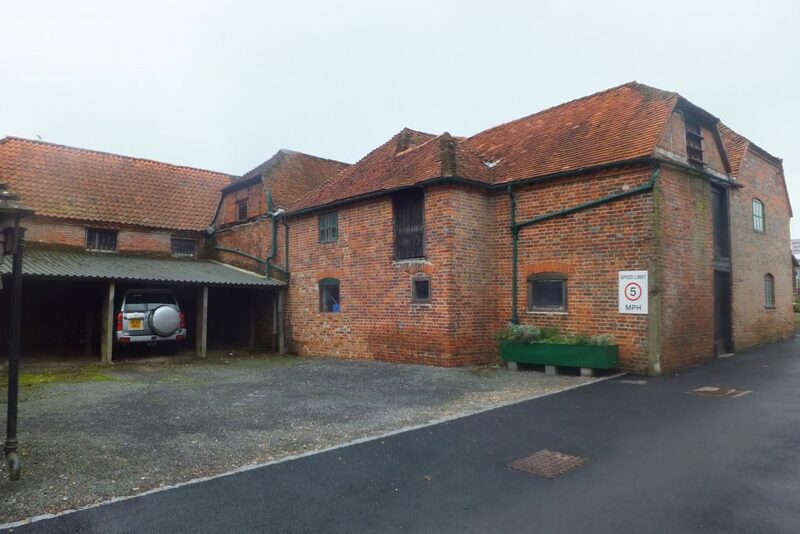 Bury Court Farm Bentley. 2016. Now a wedding venue.with Kentish cowls added for effect. 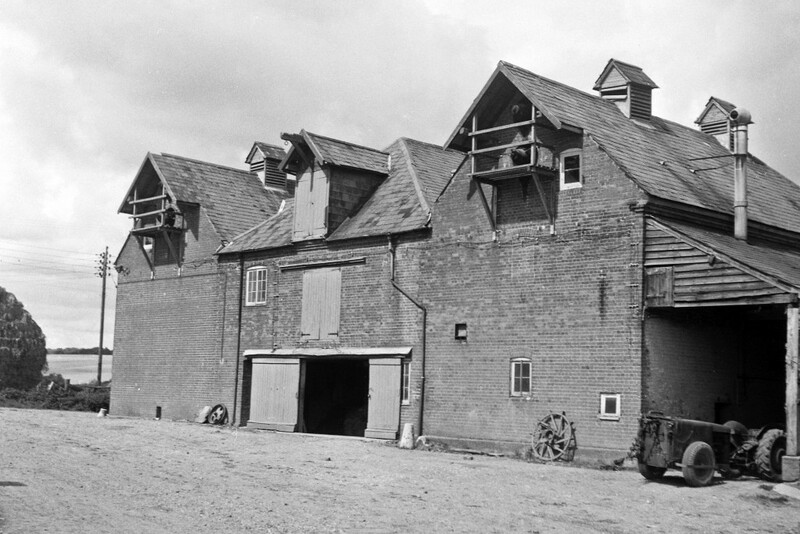 As production of hops at Bury Court grew in the 19th C so large new kilns were built, later equipped with oil burners and fan drying. The 1960 and 2016 photos show the changes that can be wrought in agricultural buildings. Bury Court, Bentley. 1960. Note the vintage tractor. 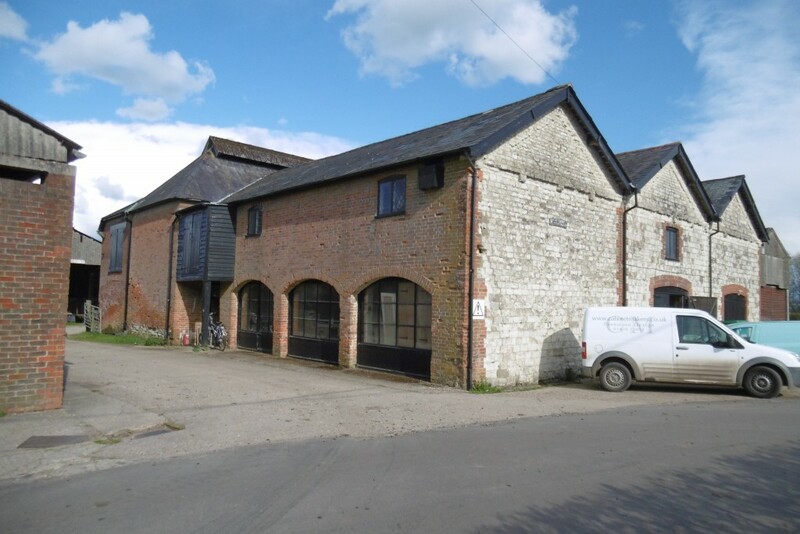 Cheeks Farm between Farnham and Bentley has a large hop kiln with three linked drying floors and with a long louvred vent stretching across the kilns, ty[pical of Surrey/Hampshire. This is a rare example of a building which has not yet been converted to other use; instead it houses a joinery operation. 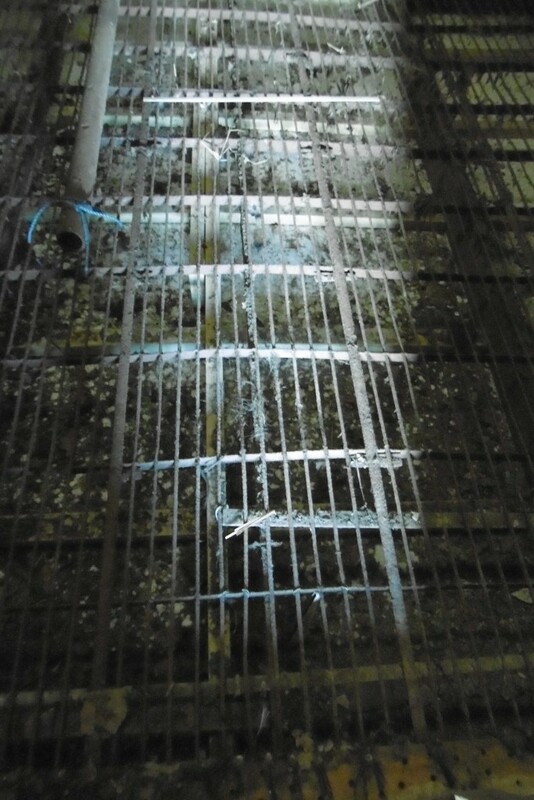 Many features remain as they were when drying operations ceased more than 50 years ago. 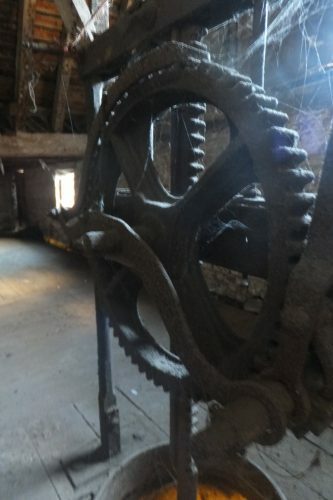 They include a 19th C iron hoist housed in a small wooden balcony which can be seen in the external photograph and drying floors of iron rods, still safe enough to walk on.